Mike Zurinskas, Manufacturing Quality Engineer, Selena Flores, Quality Inspector, Deepak Kaphle, Quality Control Technician and Nick Franklin, Engineering Technician 2, completed IPC-A-610 Certification. IPC-A-610, Acceptability of Electronic Assemblies, is the most widely used electronics assembly standard in the world. Key members of Evluma’s quality control staff: Mike Zurinskas, Manufacturing Quality Engineer, Selena Flores, Quality Inspector, Deepak Kaphle, Quality Control Technician and Nick Franklin, Engineering Technician 2, recently completed IPC-A-610 Certification. IPC-A-610 certification is a must for all quality assurance and electronic assembly departments. While Evluma’s strategic electronic assembly partners carry this certification, IPC-A-610 certified staff experts are part of Evluma’s demanding in-house quality assurance initiative. 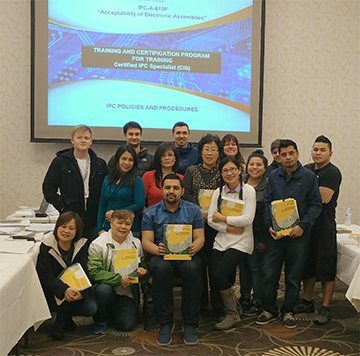 Evluma’s active participation in such demanding training and certification programs is part of our long-term commitment to our customers and our staff. Training and testing for the certification covers topics such as flex attachment, board-in-board, part-on-part, both lead-free and tin-lead criteria, component orientation and soldering criteria for through hole, SMT, cleaning, marking, coating and laminate requirements. Evluma extends a hearty Congratulations to our new specialists! Thank you for making our products the best that they can be!